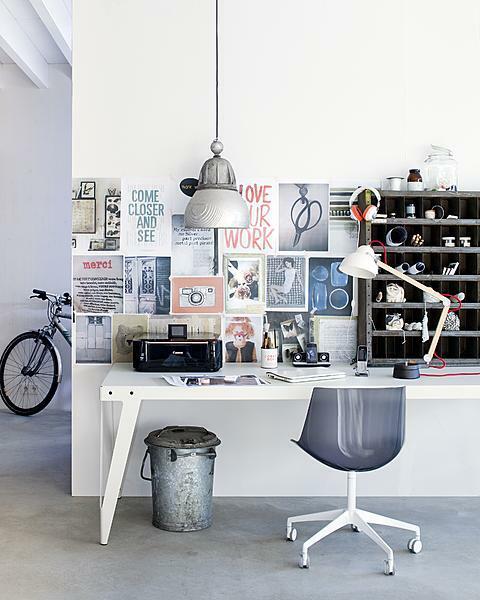 How is this for an inspiring workspace?! I’m showing this to Sophie and Aurora tomorrow! Wauw, what a beautiful picture. I Love the table lamp. What brand would it be? I am very curious. love everything about this photo! lamp, chair, moodboard. even the bicycle at the back. Nice contrast, and plenty of space on the desk. Even storage for small stuff. Have a nice tuesday evening :) L.
like the idea of coralling all the little bits into cubbies like that – what a clean look. Well if you can’t have a window, then you may as well look at something inspiring, which this is. And so do I. Lovely! This is beautiful! Love the combination of vintage with new stuff!